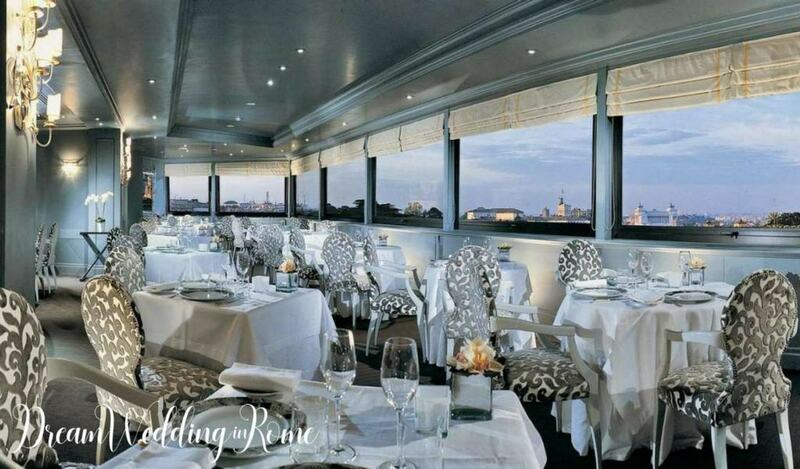 Are you looking for a Roof Garden Restaurant in a luxury hotel for your destination wedding in Rome? 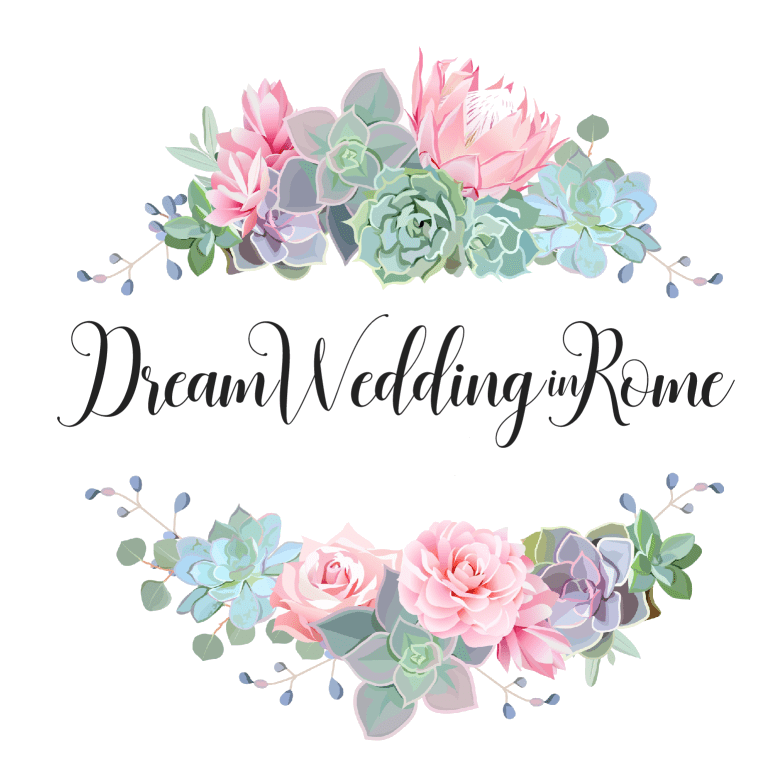 Let me drive you in a guided tour through some of the best venues that offer a Roof Garden with a panoramic view of Rome. 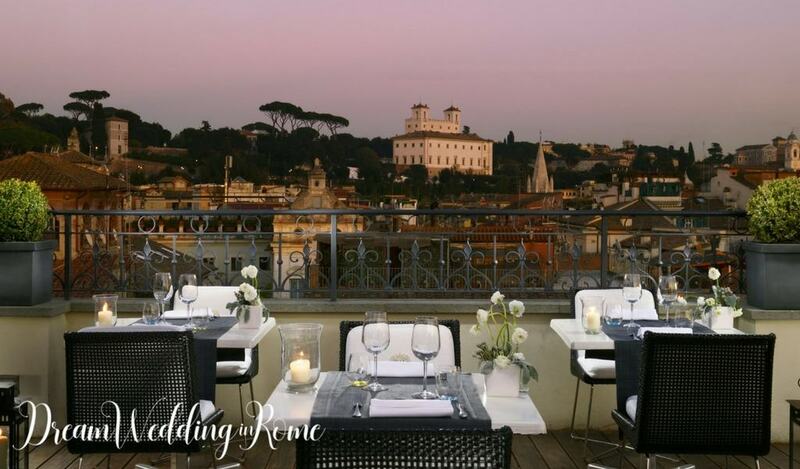 The perfect terraces for a wedding in the eternal city. 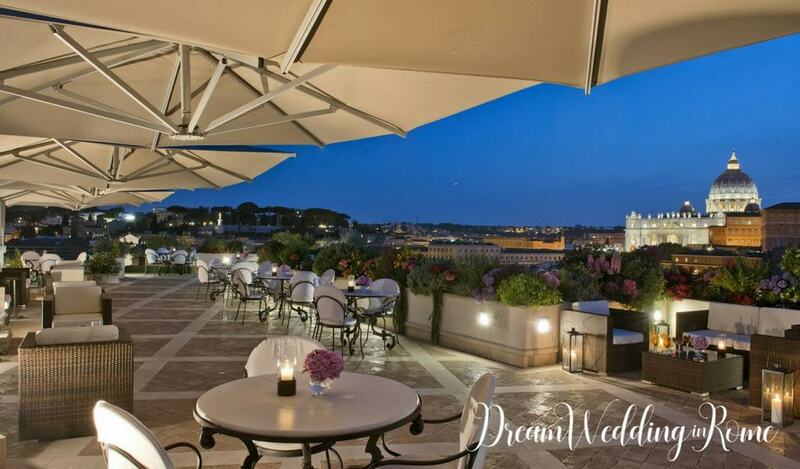 Only a few steps away from Piazza del Popolo, it offers a panoramic terrace with a 360 degrees view. The Roof Garden can host up to about 60 people for a served dinner, and about 100 people for a buffet dinner. Inside, there’s a neutral colored room in a glam environment to host around 100 guests (placée dinner). One of the most beautiful and enjoyable views of Rome. Located at the top of the Trinità dei Monti and above the Spanish Stesp, it offers several inside and outside environments. On the ground floor: a beautiful garden, adjoining the inner room where the red color predominates, and can host even 100 seated guests. 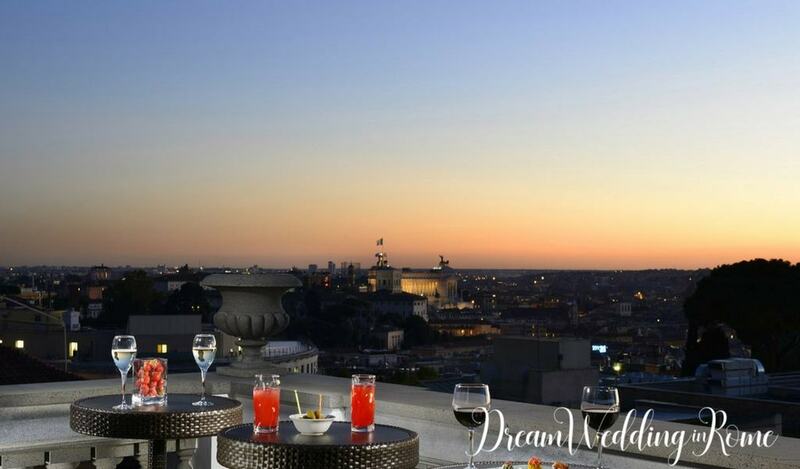 However, what will leave you astonished and amazed is, of course, the terrace: located on the 7th floor of the hotel, it offers an almost complete view of the city. What about the staff? Very kind, available, professional: A-plus! 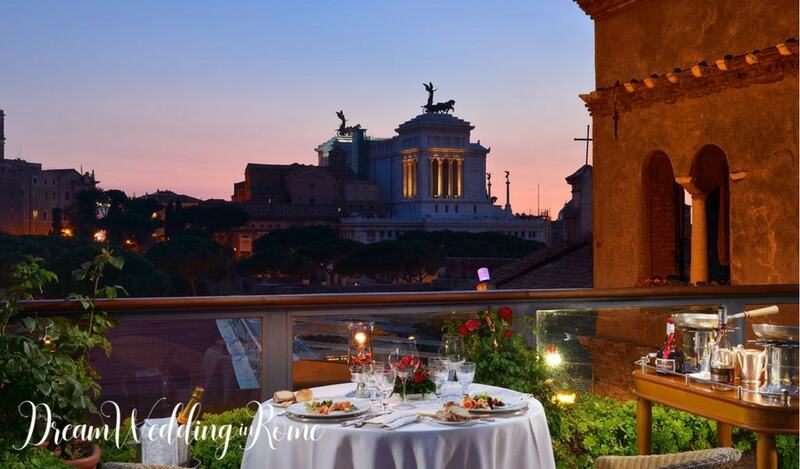 From here you can enjoy an outstanding view over the Fori Imperiali, unto Piazza Venezia. The terrace is quite spacious, able to guarantee about 120 seats. 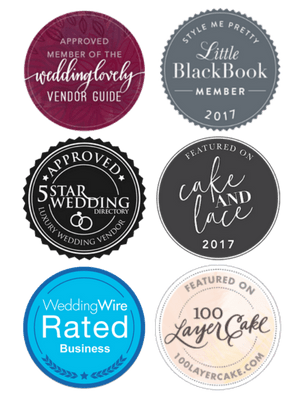 The staff is qualified, kind and very professional. 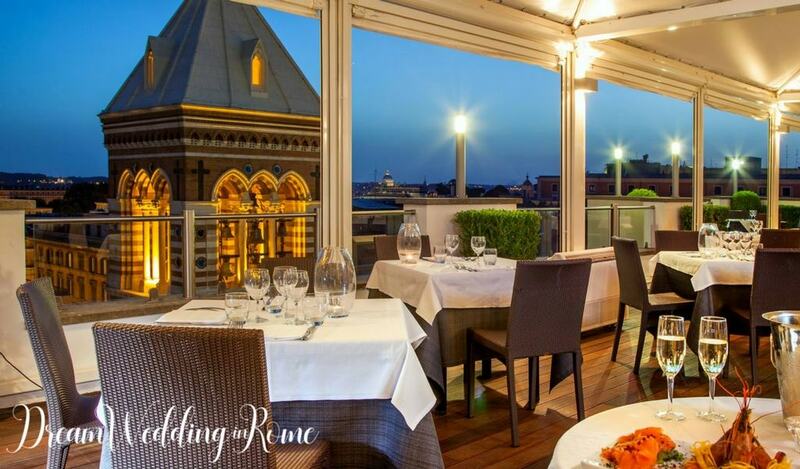 Hotel that overlooks Via Nazionale, a few steps away from Piazza della Repubblica. It’s a design environment with a restaurant located on the top floor, provided with a panoramic terrace, actually enjoyable all year round. 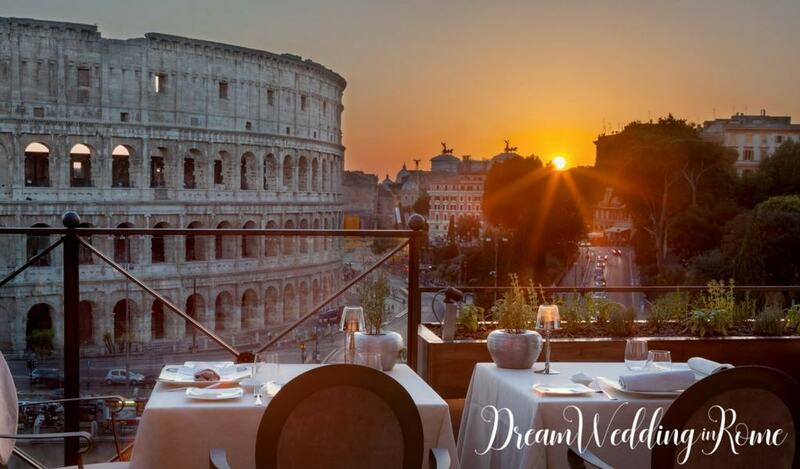 Located in Piazza Minerva and very close to the Pantheon: it’s a Hotel with a beautiful and thoroughly well-finished modern style. It offers a very roomy roof garden: in the uncovered area, even more than 100 seats for guests are guaranteed, while the restaurant is covered and next to the terrace. Should it rain, the location has a wonderful inner room. In front of the Colosseum: breath-taking view! The hotel is very thoroughly cared. The terrace has a modern style and hosts a bar and two rooms where you can have a great aperitif and enjoy this outstanding view. The staff is young, kind, available and professional. 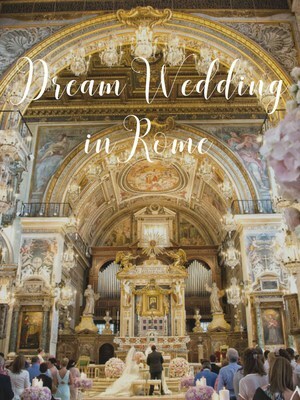 Located at the corner with Via Veneto and very close to Villa Borghese. Provided with two panoramic roofs: one is for the warm season, while the other one is enjoyable all year round, thanks to its outer covering and the curtain walls, which let you enjoy the amazing view. This building’s terrace offers a literally breath-taking view: from St. Peter unto the Vittoriale. 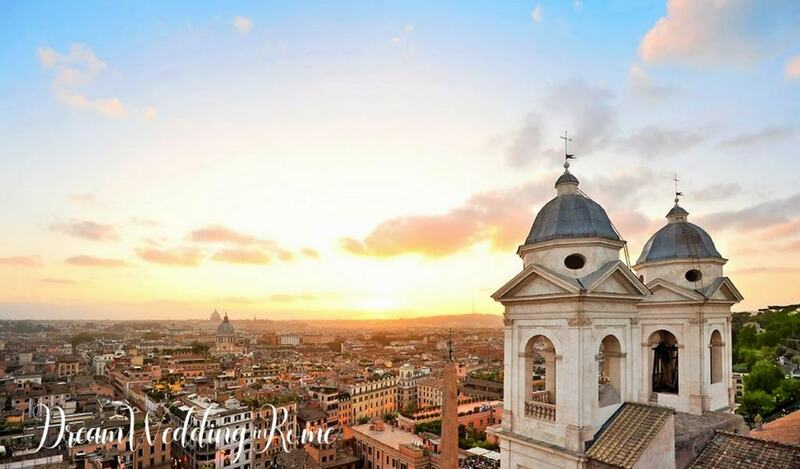 The city center is very easy to reach, as the hotel is located a few steps away from Piazza di Spagna. Noteworthy, is the fact that the restaurant has recently achieved one Michelin Star. The hotel is very close to Vatican and Castel Sant’Angelo. 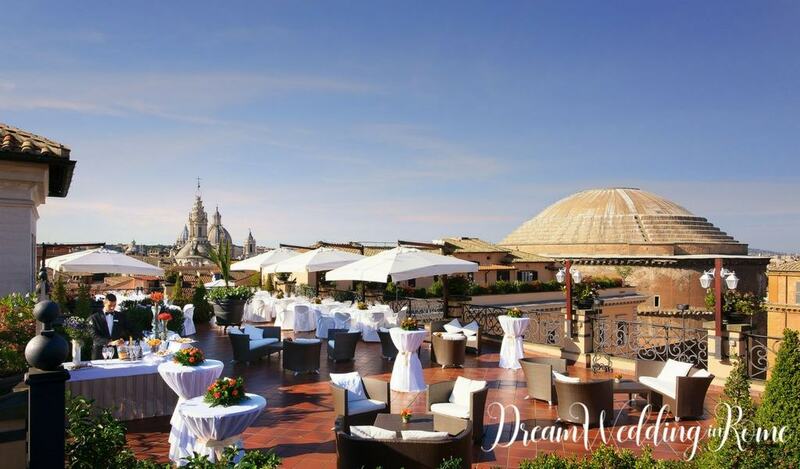 The Paradiso terrace can host up to 200 guests, and offers a pretty close view of the St. Peter’s dome.